“I can’t emphasize enough (that) there is a driver shortage and the pay is good,” said Ron Bohle, an instructor in Hawkeye Community College’s commercial driver’s license program. “Those companies that are out here are just paying really a phenomenal wage.” He noted starting pay typically ranges from $45,000 to $65,000 per year. And for those who have served in the military, Hawkeye is able to provide help with fees and tuition during the six- and 16-week programs at the Regional Transportation Training Center. The college received a grant from the U.S. Department of Transportation’s Federal Motor Carrier Safety Administration that it calls Trucking with the Troops. Military veterans, their spouse and children can get part of their tuition covered along with fees related to training to drive a semi truck. Constance Grimm, director of grants and resource development, said Hawkeye was awarded $100,524 last fall that is being matched with $25,132 of funds from the college. Grant money covers fees for such items as fuel and tires, a physical, a drug screening, the driver’s license and student activities. “It will kick back a little bit of the tuition fee, also,” she said. In some cases, Grimm noted, veteran’s benefits have been used to cover the rest of the student’s tuition. Nine veterans or family members who are recipients of the grant have completed the course so far. Another six are currently taking one of the courses. The college is hoping to sign up more and is currently enrolling for spring semester. An open house Saturday morning will allow people to learn more about the program. Daniel Snook, a member the Iowa Army National Guard, is enrolled in the 16-week course and has received some grant funds. The initial amount was $2,100, about half of the total tuition, and grant funds have since paid for permit and license fees. “It’s just for me a couple less things to worry about,” said the 19-year-old Elk Run Heights resident and 2016 East High School graduate. He works as a mechanic in the Guard and will enroll in Hawkeye’s two-year diesel tech program next fall. The program was already full when Snook applied for it this year, so some of his co-workers mentioned the truck driver training. Snook began working at Fahr Beverage early this year as a support person for the company’s truck drivers. That meant traveling with them to deliveries to help unload and sometimes getting behind the wheel of their 36-foot rigs, since he already had a commercial driver’s permit. This week he started the on-the-job training portion of his truck driving course and is now driving those trucks himself. That’s been the goal since he started the job. “They want their support guys to have a CDL, because then it’s easier for their drivers to take time off,” he said. Three other people with military service currently in Bohle’s class range in age from 28 to 57. “It isn’t usually a first career choice,” he said. 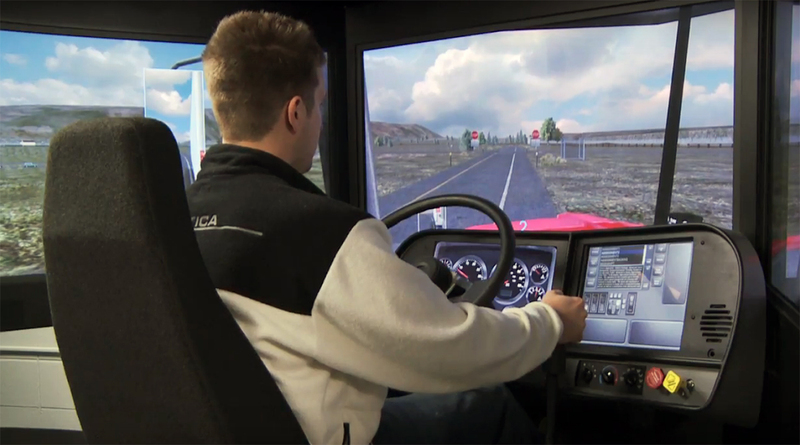 Students have often worked in another field and gotten laid off before coming to truck driving. With Iowa Workforce Development projections of more than 1,400 annual openings for truck drivers in Iowa through 2022, job prospects are good when they finish the program. Instructor Roz Dallenbach works with the students weekly during the first part of the class to prepare resumes and applications as well as connect them with recruiters from trucking companies.